MOV is a very well-known video for iOS devices developed by Apple in the year 1988. This format always uses the MPEG-4 codec for the compression and it can hold the audio, video and subtitles in a single MOV file. This format is developed to run on the iOS and Mac operating system. But if you are a Window user, and want to play MOV videos with your video player, you will find out that the MOV video can’t be played on the Windows Media Player in best quality. So you will need to convert MOV to WMV for playback on Windows Media Player. In this article, we’re going to introduce how to convert MOV to WMV with several helpful online and desktop video converters. 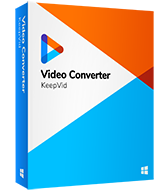 KeepVid Video Converter is a fantastic video converter application for Windows or Mac operating systems. This video converter software can help you to convert from one video format to another 1000+ video formats with few clicks. There is an editing feature in KeepVid Video Converter which enables you to edit videos before conversion so that you can get the video in accordance with your requirements. 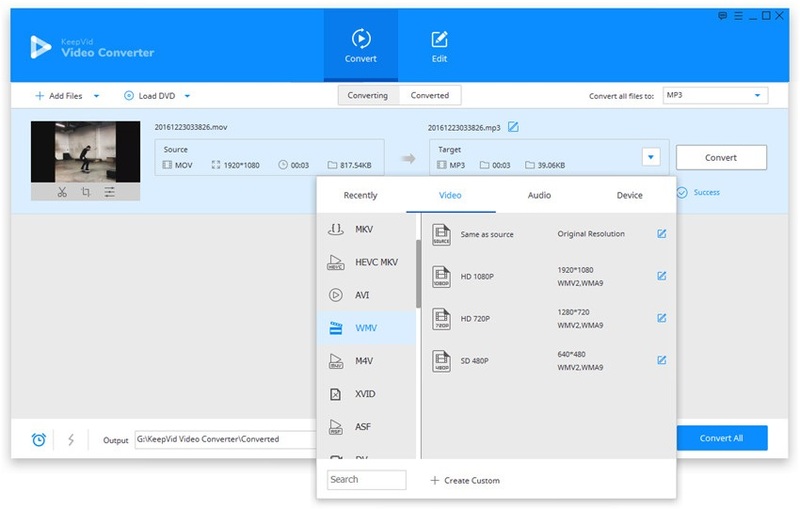 KeepVid Video Converter also supports batch download, so you’re able to convert multiple videos in one time. The following part will show you the key features of KeepVid Video Converter and how to converter MOV to WMV with this converter. The high-speed conversion feature helps you to convert videos with 30x faster speed. Convert videos for you device directly with the helpful output format list. Step 1. Start KeepVid Video Converter and add MOV video from your computer. Step 2. Select WMV as output format and click the Convert button to start converting MOV to WMV. Step 3. Go to Converted tab and find the converted video. Download and install KeepVid Video Converter in your computer, then start it. 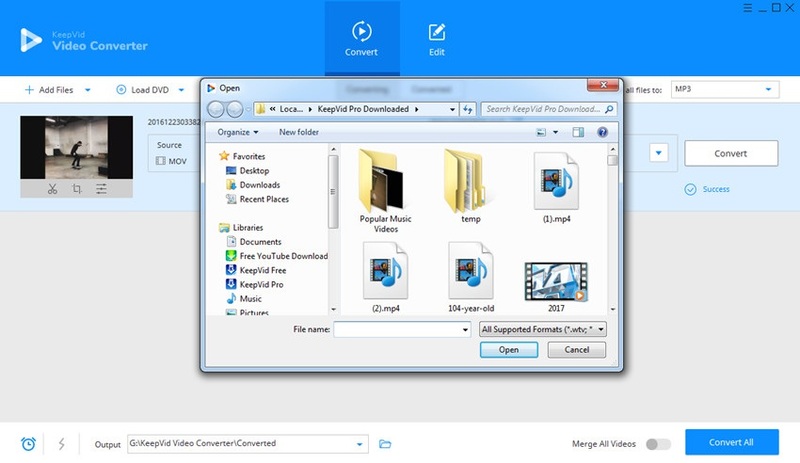 Now choose the Convert section, and click the Add File or Add Folder button at the upper left corner of the main interface to add the MOV video from your computer. The program will display the detailed information of the imported video. Now you can click the inverted triangle at the right side of the Target area, and select WMV as an output in the pop-up dialog. Or you can click the inverted triangle icon at the right side of the Convert all files to button, and select WMV as the output format. Now click the Convert or Convert All button to start converting MOV to WMV. The program will display the process of the conversion. When the conversion finishes, you can go to the Converted tab to get the converted file. Or you can right-click the converted file and choose Open File Location to find your converted video. With the help of KeepVid Video Converter, you're also allowed to convert WMV to MOV in very easy steps. The convert convert help you to get the work done in easy steps. • Before using a video converter, you can take a look at the reviews of the product. Users will talk about the functions of the program. • Double-check the size and quality of the output file before conversion. At times, the converted file has lower quality of the original file. • Edit videos before conversion with the editing features, so the output file can meet your requirements. In this part, we're going to introduce you the top 3 helpful MOV to WMV online and desktop video converters. When it comes to online video converter, KeepVid Online Video Converter is regarded as one of the best. It can convert more than 50 video and audio formats, and it allows you to get the original video quality. With an easy-to-use interface, you just need to upload the MOV video on website and choose output format as WMV. Then click the Convert Now button to start converting video. When the conversion finishes, you’ll have several ways to get the converted video. Free Video Converter is a free video converter program for Windows users. This program is available there with a very neat and clean interface. It supports batch video conversion so there is no need to add the videos one by one. The program will help you to convert MOV to WMV in simple clicks, and it supports to convert up to 40 video and audio formats. 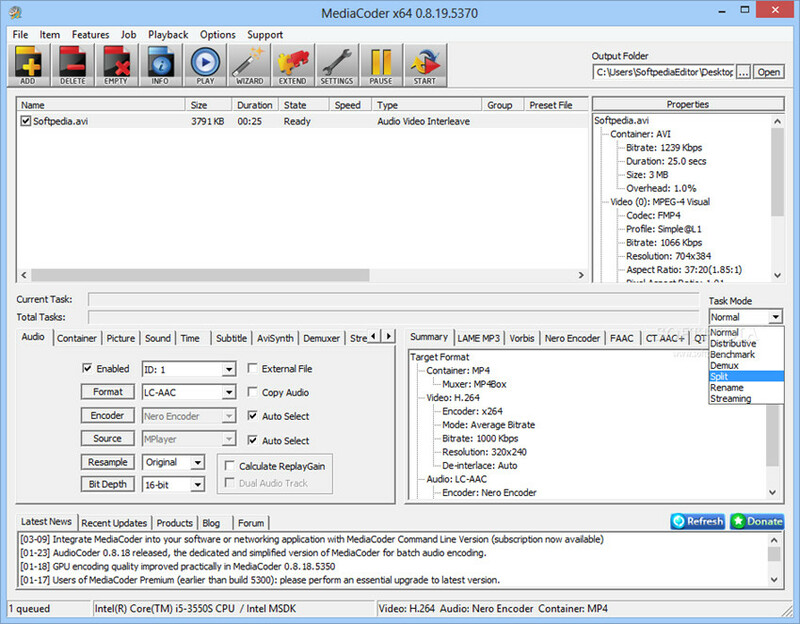 Media Coder is a piece of video editing software with video converting features. It was developed and introduced in 2005 by Media Coder website. This program keeps updating regularly, so you will have good using experience. This program is free but the interface of this program is little hard to use for all users. The great part of using this software is that you will get the converted video in original quality.